14", 2008, Traditional black velvet Golly with thumbs, embroidered mouth and eye backs, black plastic eyes, a velvet button nose and black mohair hair. 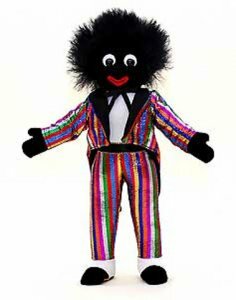 Golly wears a multicolored striped long tailcoat and trousers. His shirt is white velvet, black satin lapels, black grosgrain bow tie. Non jointed.